Welcome to 100+ Years of Commercial Flight! 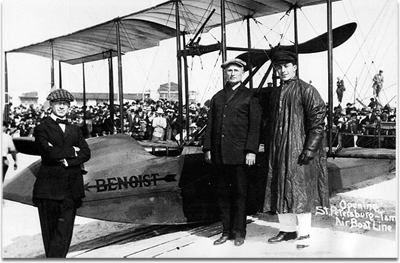 Just over 100 years ago, on January 1, 1914, a small plane lifted from the water in St. Petersburg’s downtown with just one passenger, launching the world’s first regularly scheduled commercial airline flight. The idea of the airline was Percy Fansler’s. Percy was an engineer from Jacksonville, Florida. His vision convinced a dozen St. Petersburg business men and the Board of Trade to invest in a commercial airline to fly from St. Petersburg to Tampa, just ten years after the Wright brothers’ first flight. The St. Petersburg-Tampa Airboat Line was born.